Edessa is a small city 45 miles (75 km) west and a little north of Salonika. Its most famous and best feature, and what makes a trip there well worth are its magnificent waterfalls. The falls can be seen tumbling 250 feet (70 m) over the cliff on which the city is perched from miles away as one approaches from the east. Unusually, for an arid country like Greece, Edessa is a city defined by water; indeed, the city's name means "Tower in the Water." The Eddessaios river comes into the city from the foothills of the Pindus Mountains to the west, and is then channeled via concrete banks through the city, finally spilling over the cliff's edge in one large, and two small waterfalls. 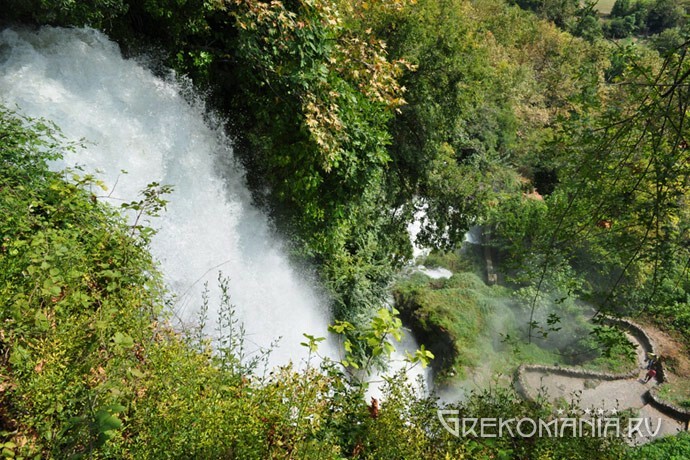 Water is life, and for that reason Edessa is a city full of the greenness that life provides. 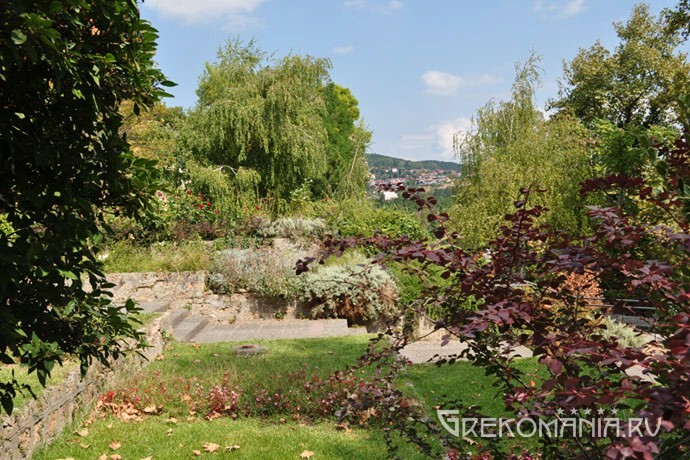 The Eddessaios provides water for the abundant plant life in the city, for the trees in its beautiful parks, for people to drink and to bathe in, and even to water the extensive cherry orchards out west of the city. That's one reason June is an excellent month to visit; there are cherry stands along the road heading west into the mountains selling the biggest, juiciest, cheapest bing cherries in Europe. Cherry season runs from mid-May into early July. 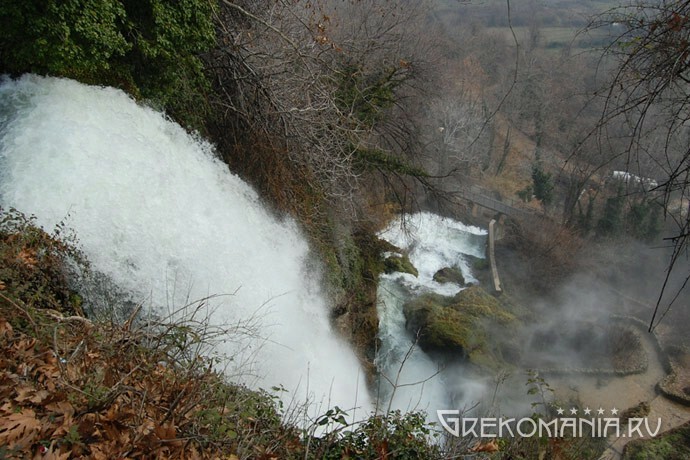 Even on the hottest summer days, mist from Edessa's waterfalls can cool you off. 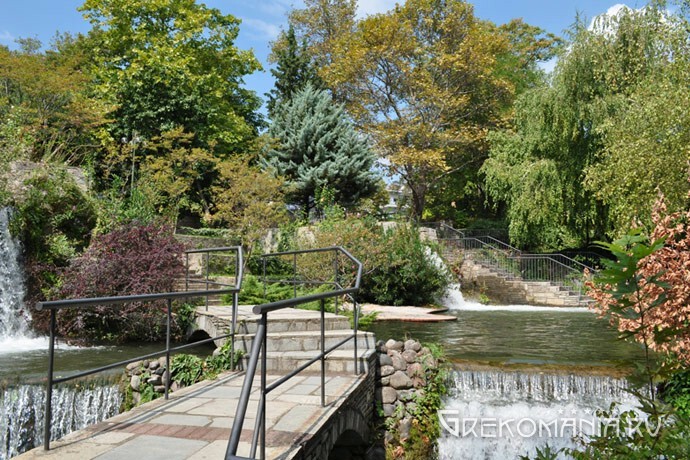 Waterfall Park (Parko Katarakton) at the cliff's edge in the city center is a beautifully designed place of mini waterfalls, footbridges, ornamental plants and concrete pools. There are steps leading down to both the large falls, called Karanos, and the twin falls, called Diplos, requiring a slow descent. At the base of Karanos is a stone-paved path that leads to a mist-damp bridge connecting to Diplos. 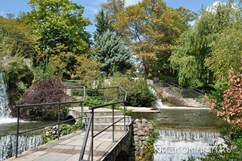 The water has been channeled with concrete banks between the city's buildings, and runs right through a shaded cafe in the Park, both halves of which are connected by a railed footbridge.. The falls themselves are floodlit at night. Edessa is a very old city; there is archeological evidence of over 3,000 years year of human habitation. 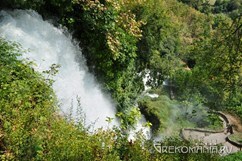 The extensive ruins of Ancient Edessa can be found on the plain about 500 yards (450 m) south of the foot of the falls. The ancient agora has been uncovered, including an inscribed column from Roman times. Certainly the river ran past the ancient city at the time of its founding; its channel has since moved. Karanos (808-778 BC), the founding king of Macedon, whose descendants included Philip II and Alexander, established Edessa as Macedon's first capital. During the Roman era the city became more prominent as it was strategically sited on the Constantinople-Rome Via Egnatia as it enters the Pindus mountain range. Edessa seems to disappear from historical records after 500 AD, until about 1100, when it is mentioned in the Bulgarian Wars of Emperor Basil II, and given a Slavic name, Vodena, Slavic for "water". Before falling to the Ottoman Turks in the late 1300's, Edessa was fought over and controlled, in turn, by the Normans, the Byzantines, The Niceans, and the Serbs. Like the rest of Macedonia, Edessa reverted to Greek control in 1912. In 1944, during the Nazi Occupation, the Germans burned half the city down, and thousands lost their homes, because the Greek Resistance had killed a German soldier. The city was also attacked during the Greek Civil War (1946-49) by Communist forces. Edessa is home to the Folklore Museum, which features collections and items of the Edessa-area folk culture. Including items and exhibits related to agriculture, animal husbandry, weaving, candle making, and sericulture, or silk farming. There is a water museum as well, whose exhibits feature water industry tools, and an aquarium with amphibians, turtles, snakes, and a crocodile. Edessa also has an Older Quarter with timber and plaster buildings of a couple centuries ago, and a Byzantine-era bridge. 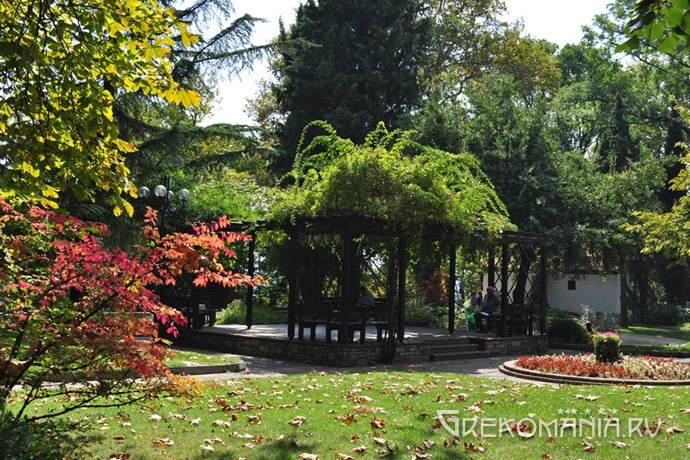 Edessa is well worth a day trip from nearby Salonika, and visitors might want to stay the night to taste the night life of this small city, and enjoy the floodlit falls.